If you would like to request a song to be played or make a dedication for a patient currently staying in Maidstone Hospital, please contact 01622 224747 email requests@hrm.org.uk or send a text to 07594 566790. Don’t forget you can check out the presenters in the studios by clicking on the webcam links here! For fundraising contributions, sponsorship and donations, please visit our Fundraising page for full details on how you can help HRM. I’m Andy and I’m HRM’s engineer, current webmaster and part time weekday evening presenter. I originally joined the station in 2006, mainly for the technical side as my interest in all things radio stemmed from my childhood and some work experience spent at a local radio station. My first on air presenting was on a co hosted show on Thursdays, but now days It’s just me. 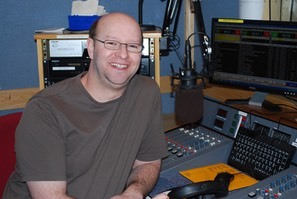 You can hear me on Tuesdays from 7.00pm to 9.00pm playing your requests and loads of great music as well as 10.00pm to 11.00pm playing all the good things (and some of the bad ones!) from the 80’s and 90’s. Other that the presenting, I’m kept busy with trying to keep the huge amount of equipment working so that HRM can keep the patients entertained, there is always something to fix or improve so it’s a never ending but rewarding task. You will also find me helping the large animals at the HRM fundraising collections and events. I hope everyone feels better soon, If I can just cheer up one person whilst they stay in hospital then it’s all worth it!